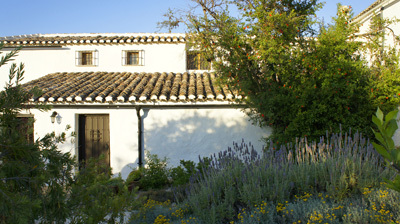 Inspected and selected by Alastair Sawday’s Guide “Special Places to Stay in Spain,” Cortijo Las Rosas is set in the heart of rural Andalucia in the midst of tranquil olive groves. We have renovated an old cortijo to provide three individual ‘casitas’ for discerning guests to relax and enjoy the surrounding peace. Ideally situated, it can be reached with a journey of about 1-1/2 hours from Malaga Airport and a little less from Granada Airport. It is also located on the crossroads between all the major cities in Andalucia, allowing for day trips to Granada, Seville, Cordoba and Malaga as well as the towns and beaches of the Costa del Sol. 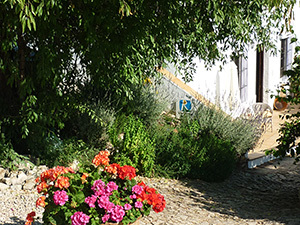 Set up in the mountains some 8 km from the town of Iznajar, Cortijo Las Rosas is located close to the largest lake in Andalucia. This provides us with an inland beach right on the edge of The Subbetica – a national park dotted with traditional ‘white villages’. There are opportunities for walking, cycling, horse riding, bird watching and other outdoor pursuits. With a locally based guide on site to provide welcome packs, help and information if required, you can enjoy a tranquil break far removed from the usual tourist traps provided by more commercial accommodation. Your individual casita has a lounge, kitchen and bedrooms with ensuite bathrooms. Each has its own individual traditional courtyard with barbeque, whilst the swimming pool with its panoramic view over the olive groves is shared between the three casitas. The accommodation is flexible, sleeping from 1 – 10 people and can be configured to suit your needs. 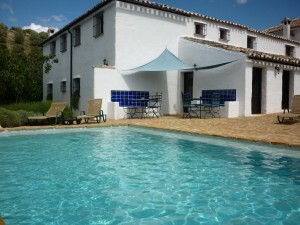 Cortijo Las Rosas can provide you with the ideal tranquil get-away.